Unfortunately, last week the Court of Common Pleas reversed the decision of the Zoning Board and thereby approved the permit to let the Healing Way Methadone Clinic open at Frankford and Decatur; we find this decision to be most disappointing and vow to continue to fight the opening of this clinic. With two clinics approved within one mile of each other, there will be an oversaturation in our community. If you want to help out, we need people to solicit donations to pay for legal fees to further our own appeal. Please contact us at mayfaircivicassociation@yahoo.com if you would like to help. The Proposed Use, Two (2) Family Dwelling, is prohibited in this Zoning District. OUR NEWEST ALUMNAE MEMBERS ! We are pleased to announce the appointment of Dr. Joanne Walls as the next principal of St. Hubert Catholic High School for Girls! Dr. Walls has great ideas and strengths that will truly lead St. Hubert forward! thinking of us while they sip their favorite drink ! in time for camp and back-to- school. SAVE THE DATE !! - Philmont C.C. My tenure as President has been an exciting one and I feel that I, with full cooperation of the Board, have completed many of the goals that we have set out to complete. With my added duties at home as a husband and a father, along with my election as Chairman of the Mayfair CDC and new responsibilities in my professional career, I feel that I would be stretching myself thin to continue on in my capacity as President and could potentially do the Mayfair Civic Association a disservice by trying to do too much. I have therefore appointed you, Secretary McDermott, per our bylaws with authorization of our Executive Board, to carry out my term through November 2015. 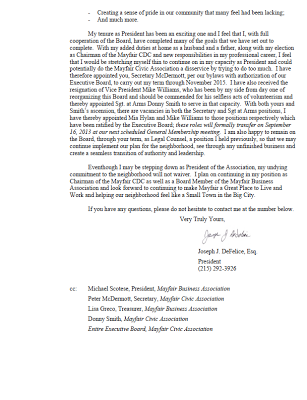 I have also received the resignation of Vice President Mike Williams, who has been by my side from day one of reorganizing this Board and should be commended for his selfless acts of volunteerism and thereby appointed Sgt. at Arms Donny Smith to serve in that capacity. 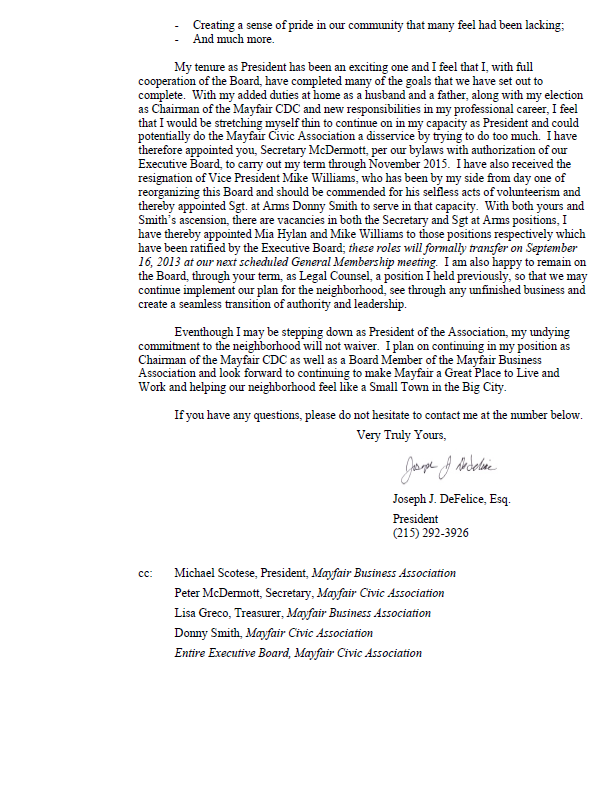 With both yours and Smith’s ascension, there are vacancies in both the Secretary and Sgt at Arms positions, I have thereby appointed Mia Hylan and Mike Williams to those positions respectively which have been ratified by the Executive Board; these roles will formally transfer on September 16, 2013 at our next scheduled General Membership meeting. I am also happy to remain on the Board, through your term, as Legal Counsel, a position I held previously, so that we may continue implement our plan for the neighborhood, see through any unfinished business and create a seamless transition of authority and leadership. Eventhough I may be stepping down as President of the Association, my undying commitment to the neighborhood will not waiver. I plan on continuing in my position as Chairman of the Mayfair CDC as well as a Board Member of the Mayfair Business Association and look forward to continuing to make Mayfair a Great Place to Live and Work and helping our neighborhood feel like a Small Town in the Big City. Meeting called to order at 7:11pm by President Joe DeFelice. Representative Kevin Boyle (172nd District) spoke to the membership about the recently approved re-districting in Pennsylvania. He explained that every 10 years, because of population movements, the lines of districts are redrawn. Rep. Boyle currently represents approximately 60% of Mayfair but with redistricting it drops to about 40%. Representative John Taylor (177th District) will be the current representative to Mayfair. Rep Boyle’s office will remain on Frankford Ave and he encourages constituents to contact him and he will help regardless of district. Mayfair will remain under the 172nd district until the election in 2015. Rep. Boyle discussed that the state budget needs to be passed by June 30, 2013 as well as the anticipated budget shortfall for the School District of Philadelphia. It has been proposed that a10% increase on the liquor tax on restaurants and bars may help with this deficit. Rep. Boyle then took several questions from members present pertaining to the School District of Philadelphia and redistricting. If interested in membership, attendees were asked to see Assistant Sergeant at Arms, John Jenkins to obtain an application and pay for membership. Applications can also be obtained at the Mayfair Civic Association website at mayfaircivicassociation.com. 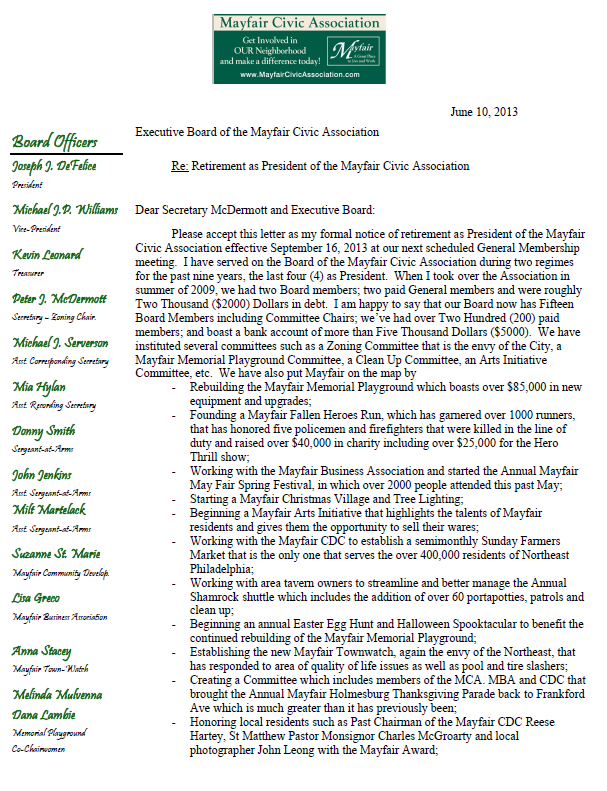 **The current balance does not currently reflect this weekend's revenue and expenses from the Mayfair May Fair and Mayfair Fallen Heroes Run. When these numbers are available they will be reported. Applicant looks to legalize the erection of 14'6" x 15'6"addition in their rear yard. The zoning permit they filed was initially denied by the Department of Licenses and Inspection because it is not in compliance with the rear yard set back of 15 feet. Ms. Arthin got a permit when the deck was initially built but looked to install a permanent roof on to the deck due to a genetic history of skin cancer to protect her sister, the primary daytime caregiver of her children, as well as her own children. Ms. Arthin and her husband assumed that the contractor they hired got the correct permits for the installation of the roof structure but discovered they had not. They are looking to legalize the structure. Ms. Arthin presented several pictures along with the blueprints of the current deck and roof, as well as a signed petition from 13 neighbors with no objection to the addition. The Zoning Application was "Not Opposed" by a majority of members who were present and eligible to vote. President Joe DeFelice asked that a proviso be added that the Arthin's join the Mayfair Civic Association. They responded that they have no objection to becoming members of the MCA. Save-A-Lot will be going into the old Worldwide Aquarium and Pets. Through the new zoning code the building is zoned as (CA) Commercial Auto. Save-A-Lot applied for construction and sign permits and everything is legal. Several business owners along State Road have filed an additional appeal regarding the ZBA's recent decision regarding NET and have retained the services of a pro bono attorney. Several trial dates of the Mayfair Arts Initiative were held in the spring. The Mayfair Arts Initiative will be put on hold for the time being until September. · This is the sixth year for both the MFMF and the Mayfair Fallen Heroes Run held on Saturday, May 18, 2013. · There were approximately 550 participants for the Fallen Heroes Run. Since the MFHR was only 2 days ago the amount of money raised is very preliminary at this point. An update will be given once the exact number is known. · For the MFMF, an estimated 2000 people were present on Frankford Avenue for MFMF along with the Original Soft Pretzel Factory's Customer Appreciation Day. This year the MFMF closed off Frankford Ave from Bleigh to Wellington and condensed all the participants into that area where there was live music, approximately 30 crafters and entertainment for families and children. · President Joe DeFelice asked for a round of applause for the organizers, Lisa Greco and Donny Smith. · In addition, if anyone got a ticket while parked legally on Frankford Ave this past Saturday during the MFMF please let the MCA know as there was an agreement for free parking with the PPA. The ticket will be waived if you were legally parked and Joe DeFelice will forward it to the PPA. The committee will be folded as the current chairs have resigned dues to lack community participation and interest in the project. If anyone is interested in taking up the chairmanship of this committee they are asked to please contact President Joe DeFelice or Communications Secretary Mia Hylan. · The remaining Mayfair Farmers Market dates are all Sunday's, 9am to 1pm at the intersection of Frankford Ave and Ryan Ave. The remaining dates are; June 2, June 23, July 14, July 28, Aug 11, Aug 25, Sept 8, Sept 22, Oct 6 and Oct 20. · The MFM is currently being sponsored by the Mayfair CDC and Republic Bank. Another sponsor is being solicited for the 2013 and 2014 season. Please contact Joe DeFelice (josephjdefelice@yahoo.com) or Suzann St. Marie (sstmarie1@aol.com) if you or your business is interested in sponsoring. · The CDC continues to explore a Business Improvement District (BID) for Holmesburg/Mayfair to spur business development. · The CDC has applied and been approved for a Business Privilege Tax application to partner with Allegheny Iron. Instead of paying taxes to the city of Philadelphia, Allegheny Iron would partner with the community group and directly contribute $85,000 a year to the Mayfair CDC to be used for improvement and maintenance projects in Mayfair. The Mayfair CDC was selected by the city to receive $85,000 for the next 10 years from Allegheny Iron which will go directly into community improvement projects. · The CDC is also exploring a Greening Grant of $30,000 from the city for cleaning graffiti off the poles and cleaning up the business corridor. · The CDC continues to work on a conservatorship program and is asking for the addresses of any abandoned or neglected properties within the boundaries of the neighborhood. 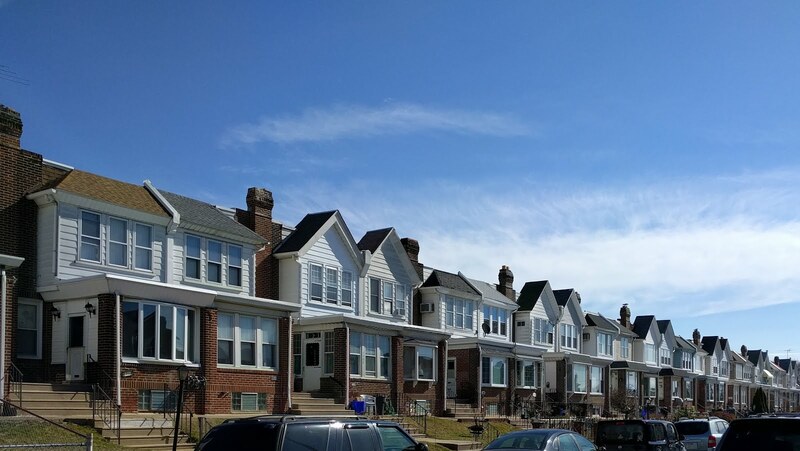 The CDC was successful in monitoring the house at Sheffield and Frankford and getting the owners of the house have been doing improvements including new windows, new flooring and extermination of the pests in the house. The house is currently on the market to be sold. 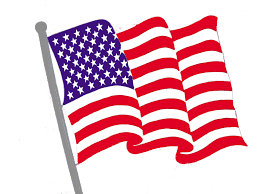 · Money continues to be raised for ongoing maintenance, funding for a new fence and additional equipment. · Visit the Facebook page at "Rebuild Mayfair Memorial Playground (at Lincoln High School)" or at mayfairmemorialplayground@yahoo.com if you are interested in helping out with future projects. · The group is still looking for volunteers to become regular patrol members. More information can be found on Facebook under "Mayfair Town Watch" or at mayfairtownwatch@gmail.com. Applications and information were also present at the meeting. Www.mayfairtownwatch.org. · Mayfair Town Watch Board Member Milt Martelack, Jr. reiterated the need for new members to patrol the streets with current member. Currently patrols are limited due to lack of patrolling members. · A volunteer team of neighbors led by Jim Ortlieb and Anna Stacey continue to hold clean-ups assisted by CLIP. Most recently they did the Frankford Ave Business Corridor, on May 4, 2013 for 3 hours. · The committee is always looking for suggestions for areas in the neighborhood that could use a cleanup. Make any suggestions about areas that need a clean-up via the their Facebook page at "Mayfair Clean-up". Ms. Treacy works with the DA’s office with CeaseFire PA, a group who advocates on behalf of communities against violent offenders who are a threat to the community prior to sentencing. CeaseFirePA is working in neighborhoods and communities across Pennsylvania to build support from the ground up for reforms to reduce gun violence. They attempt to raise community concerns regarding responsibility for gun ownership and advocate in front of judges for community members. CeaseFire PA also is looking for volunteers to be a physical presence in court as a Court Watch Volunteer, and write letters. Ms. Treacy states that a physical presence in the courtroom is best but there are other ways to advocate such as writing letters to legislators. CeaseFire PA has had success in increasing offender sentences increase because of helping with community involvement. President Joe DeFelice requested a general membership vote on amending and removing portions of the bylaws originally written and adopted on September 28, 2010. President DeFelice requests a merger of Article 4 (Duties of the Secretary) and Article 6 (Duties of the Assistant Secretary) to create one Recording Secretary position. President DeFelice proposed a change to Article 13 (Elections of the Executive Board) that November 2015 be the next election of the Executive Board of the Mayfair Civic Association. Article 9 (Board of Directors), Section 2—President DeFelice proposed the change that meetings of the General Membership shall be the third Monday of every odd month except July (January, March, May, September, and November). Yearly Dues for the Association are Ten ($10) Dollars with exception for Forty ($40) Dollars for a five year term and One Hundred ($100) Dollars for a lifetime membership. President DeFelice proposed a change to Article 13 (Elections of the Executive Board), Section 3—In the event of a death, resignation, removal of any executive board member, their role shall be filled in the interim by appointment of the President with approval of a majority vote of the voting membership of the Executive Board. President DeFelice proposed a change to Article 14 (Membership), Section 1 to scrap the A and B membership and instead that requirements for membership state you must be a resident of Mayfair (Boundaries as stated by Section III in the Constitution--The area to be served by the Association will be Frankford Ave (both sides) to the East, Sheffield Ave (both sides) to North Between Frankford and Rowland Aves, Rhawn Street (both sides) to the North between Rowland and Lexington Aves, Holme Ave (south side) to the North between Lexington Ave and the Roosevelt Blvd. and Roosevelt Blvd (east side) to the West. Blvd South to Bustleton Ave Bustleton South (east side) to the North Cedar Hills Cemetery (which abuts the Southern rear of Lardner and Benner St) then East to Frankford Ave.) and also to include any person who owns a business within Mayfair boundaries. In order to vote, such members must be in good standing and have attended at least three (3) prior meetings. This provision may be waived by the President with approval of a majority vote of the voting membership of the Executive Board. The proposals were put to the general membership eligible to vote and the motions passed unanimously. President Joe DeFelice recognized that Senator Daylin Leach (candidate for the 13th Congressional District) was present. Senator Leach is here to answer any questions after the conclusion of the meeting with respect for our current unwritten rule that candidates are always welcome to attend our meetings but they may not speak unless it is at our annual March Candidates Night. 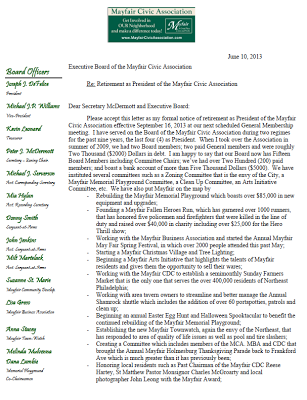 In regards to the bylaws changes for membership, Donna Donat, a member of the Holmesburg Civic, suggested that the MCA consider counting the "sweat equity" of any volunteer workers during MCA events as earning membership. The Holmesburg Civic Association uses this format with success and that the MCA should consider it as many people may not be able to attend the membership meetings at night. The next MCA meeting will be scheduled for September 16, 2013 at 7pm at the Mayfair Community Center. 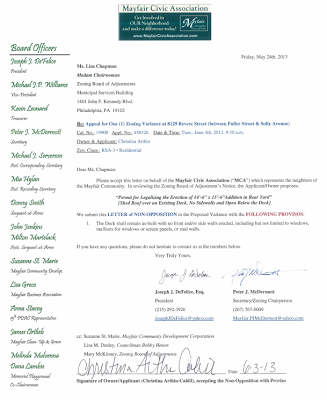 Meeting minutes submitted by Recording Secretary Mia Hylan on 06/04/2013. 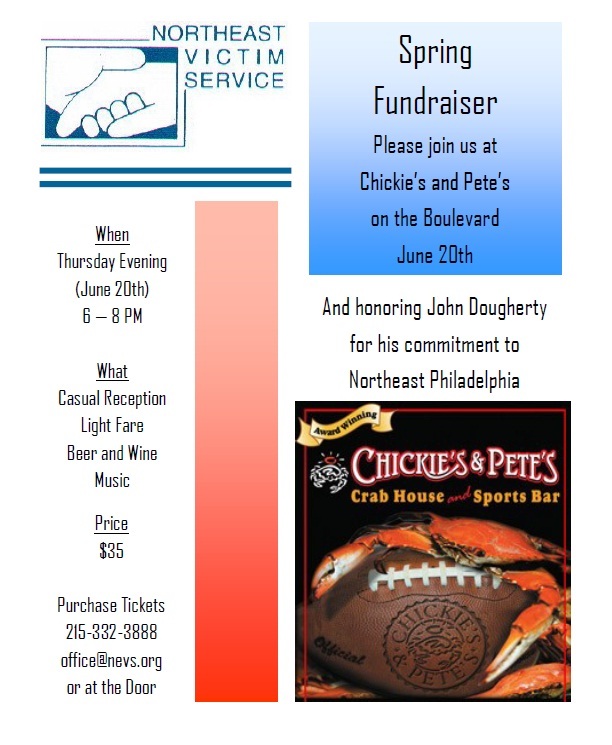 Northeast Victim Services Fundraiser Thurs. June 20, 2013 - Chickies on the Blvd.